The expansion of offshore wind energy farms shifts into high gear, because strong and steady winds on the ocean make offshore wind energy attractive for investors. The energy yield is estimated at around 40% higher than onshore. But difficult accessibility and rough environmental conditions like high humidity, large waves and the salt water make the maintenance of wind turbine a challenge offshore. With VERTEC Solutions you have a competent partner at your side. VERTEC employees have all the necessary trainings, experience and certifications to inspect and repair wind energy plant components at hard to reach places also offshore. 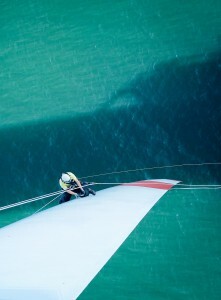 In addition to the necessary offshore certifcates in Sea Survival, Fire Escape Training, Helicopter Underwater Escape Training, First Aid, Manual Handling etc., all our employees are not only well trained industrial climbers (FISAT and IRATA certified), but specialists in their field – mechanics, electricians, fiberglass specialists, welders , locksmith and painter take care of your wind turbine competent, reliable and fast. Inspection of ladders, fall protection systems, service lifts (elevators), lifting equipment, PPE, PSA, emergency and safety equipment and appliances, etc. Other work at height, maintenance, removal of defects and installation services. For questions and offers, contact us.